Symbiosis SS-2 – is it worth the heavy weight on land? 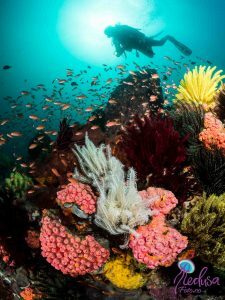 External light sources is a must for an underwater photographer. 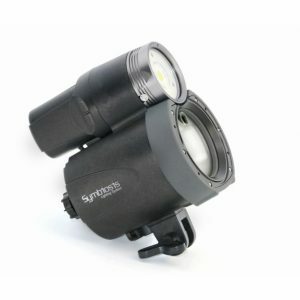 The market has lots to offer, but the Symbiosis is offering something unique that is beneficial for both photographers and videographers – a flash that consists of both a strong flash and a strong LED video light. Lars at http://www.fotografit.eu convinced me that it was worth a try. Do I agree now that I have used it for a while? The Symbiosis SS-2 is one heavy piece on land, and I had my hesitations to wether the performance of the flash would make up for the kilo the complete unit is weighting. Luckily it is only 50 grams negative under water, and that is easily neutralized by adding some floating device. The video light is placed on top of the flash unit, and comes with 2000 or 4000 lumen light head. This can easily be replaced with a stronger or weaker head depending on need. The battery of the video light is also the same battery that feeds the flash. You can use the flash alone, the video light alone or combine the two of them with different power outputs. A backlit panel with buttons large enough to be managed even by dry suit gloves and the possibilities to manually adjust the settings of both light sources makes the job easy for the user. As I earlier have been using flashes with standard AA-batteries I have lost many shots due to the battery recharging time, especially with high power outputs, and this is one of the things I simply love about this flash – it delivers! With guide number 32, and color temperature of 5700 K the flash is strong, and gives me the light I need. The recycle time is very fast, and at low power I can just press the shutter and it will fire. At maximum output I do loose a few shots now and then if I am to eager, but lot less than what I was used to before. Another thing that impresses me is how long the battery is lasting. Before I had to change my batteries in the flash after two dives (I typically do 90+ minutes dives, and shoots way to many pictures, usually 300+ every dive). With the Symbiosis SS-2 I can easily do 4-5 dives without reaching the low-power-mark. It must be said that this is when I am using only the flash, and not the light head in addition. When using the light as well, battery lasting time naturally decreases. The beam angle is a bit more narrow than on my previous flash, 90×80 degrees, but with a diffuser it increases to comfortably 100×100 degrees. Enough to cover any fish eye wide angle shots. So am I happy with it? The capacity of the battery along with the recycle time had me sold right away. I don´t need to carry an extra focus light, or even a red light for night dives since the light head offers both white and red light, both with adjustable power. Add the fact that they now have a dome diffuser that makes the light very nice and evenly spread, and that when I use the video light and the flash together the video light automatically turns off when I take a picture. In addition the panel on the back of the flash rotates itself, so I can easily read it even if I turn my flash upside down. Then only thing I miss is that the power output buttons does not have a defined stop or start point, and that I can´t feel any “clicks” in my fingers when I adjust the power of the flash. So I do have to look at the display to be absolutely certain what level of output it is on, but in my mind this is widely over run by the positive sides of this device. So the answer is: Yes! I am happy with it! Thanks to Lars Stenholt Kirkegaard and www.fotografit.eu for their support.